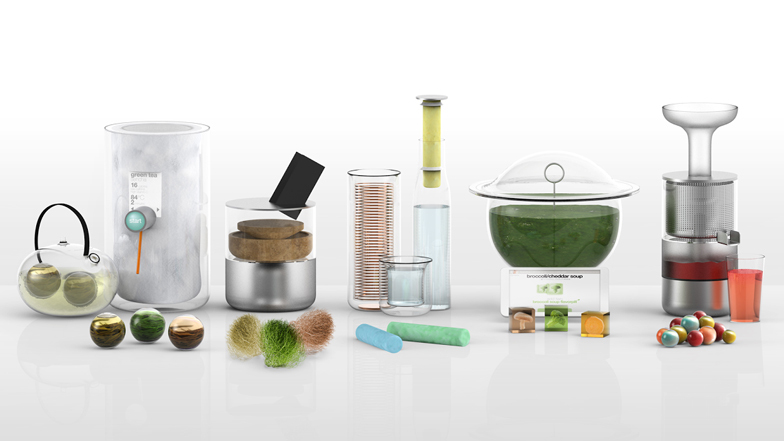 Istanbul Design Biennial 2014: Chicago studio Koz Susani Design has designed five conceptual appliances that would turn flavoured pills into ready-to-eat meals by simply adding water. Looking forward to how we might eat and drink in the future, Koz Susani Design has proposed condensing meals into small pills that contain all the necessary flavours and nutrition for their project Just Add Water. "Our concept of 'Flavor Pills' is inspired by molecular cuisine," said the designers. "Just Add Water's Flavor Pills condense flavours, spices and nutritional supplements in balanced quantities according to creative recipes from world-renowned chefs, packing them into aesthetically surprising shapes." "Instead of the food-in-a-pill imagined by science fiction in the 1960s, which deprived the food experience of any sensory pleasure, Just Add Water's Flavor Pills are a recipe-in-a-pill, meant to celebrate the sensory pleasure of a meal." These pills would then be inserted into specially designed apparatuses and combined with fresh ingredients, that transform them into food using water. "Smart appliances help process the food at home with maniacal attention to food quality and respect of nutritional values," the duo said. "They are microprocessor and sensor controlled to use exactly the right amount of speed and power for the right amount of time and use solid-state plates to keep the temperature exact." The first would create flavoured water by filtering the liquid through a cylindrical pod as it's poured out of a vessel into a double-layered glass. Pomegranate, lemon, cucumber, and mint filters would be placed into the top of a glass bottle filled with water, kept cool in a refrigerating sleeve. The glass sits neatly on top of the cooler to fully surround the bottle when stored away. Another device would turn cube-shaped flavours into warm soup, heating and mixing the pills with water and fresh ingredients simultaneously. There's also a juicer to be used with protein pouches and fresh fruit, and a "grain grinder" for mulching flavoured fibre nests with natural grains into flour that tastes like cinnamon or chocolate. The final appliance is designed to boil water and brew teas housed in spherical capsules, heating the water to the optimum temperature for infusion. A display would allow the user to select their preferred recipe and automatically start the boiling process, controlled by a microprocessor. Each of the machines is designed to be used at the table to promote the social practices associated with preparing and eating food. The project is on display at the Istanbul Design Biennial until 14 December.